Karen B. MacDonald, beloved wife of 41 years to Craig MacDonald, loving mother to Lauren and mother-in-law to Edward Sotherden, doting grandmother to Maira Sotherden, and faithful friend to Christina Lee, passed away peacefully on November 20, 2017 after a long struggle with early onset Parkinson’s Disease and Parkinson’s Related Dementia. Karen never dwelled on her diagnosis and chose to live out her life with a positive spirit and strong faith. She handled a long journey with grace and dignity. Karen was born on September 29, 1949 to Mary and Eugene Brandt. She grew up in Woodbury Heights, New Jersey and attended Drexel University in Philadelphia, Pennsylvania where she majored in Home Economics. After graduation, Karen then moved permanently to Pennsylvania, living in Mt. Airy for a period of time before she and Craig along with their daughter Lauren purchased a home in Erdenheim. They lived in that home for close to 30 years before then moving to Eagleville. Karen’s family and friends were of utmost importance to her. The love she had for her husband, daughter, son-in-law, and granddaughter was incredible. 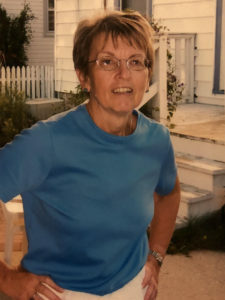 She also had an amazingly strong work ethic and took great pride in her work both at the Pennsylvania School for the Deaf as a Home Economics teacher and at Springside School (now Springside Chestnut Hill Academy) as Director of Food Services. Karen was generous with her time and expertise among her church community and through other volunteer opportunities. In her free time, Karen loved to sew and could make just about anything. She loved sharing her creative gifts with others, most especially with her daughter. Karen also enjoyed travelling and found great satisfaction in planning amazing trips to take with family and friends. She visited Belgium once and never stopped talking about the chocolate! Karen felt the love and support of family and friends, and was steadfastly cared for by her husband throughout her struggle and until the end of her life. She is now at peace and free of the body and mind that failed her, but her loss is profound. She will be missed. She already is. A memorial service will be held in her honor on Saturday, December 2nd at Noon at Good Shepherd Lutheran Church, 877 Street Road, Southampton, PA 18966. Interment will be private. In lieu of flowers, contributions in Karen’s name may be made to SCH Academy, 500 W. Willow Grove Avenue, Philadelphia, PA 19118, ATTN: Development Office. Please include “Johanna Sigmund Scholarship Fund” on the memo line.